Editor’s Note: In recent years, Amazon has reshaped entire industries with its innovations in e-commerce and its acquisitions of retail stores like Whole Foods. Today, Jeff Brown, Townhall Media’s Official Wealth Creation Expert, shows why Amazon may soon take an unprecedented step into cryptocurrencies. And as an investor, this is a development that should be on your radar. But while Wall Street remains fixated on the ups and downs of bitcoin, something unusual is playing out behind the scenes in the blockchain industry. And it could have huge implications for cryptocurrencies… and even change how business is done… forever. What I’m about to tell you may sound unbelievable. But I’ll show you all the proof. Then you can decide for yourself. 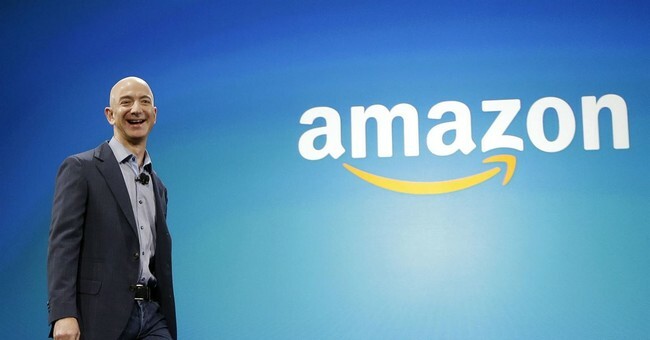 The company I alluded to is Amazon, the e-commerce and web-services giant. And I believe it is about to issue its very own cryptocurrency. You likely know Amazon as an e-commerce company. Maybe you’re even an Amazon Prime member and use the company’s fast delivery services. But investors who think that Amazon is in the business of just selling books, electronics, and dishwasher detergent online are unfortunately missing the big picture… Unless you dig in and understand what’s happening behind the curtain, it’s easy to miss. I mention this briefly because it’s a bit of an “elephant in the room” for readers of Bill’s daily Diary. I’ve known Bill for a while now. I have nothing but respect for him. And he’s had some great calls over the years. Yet on Amazon, we certainly agree to disagree. We first discussed Amazon over breakfast in July 2015. I contended that the company’s stock was worth every penny and that it belonged in every investor’s portfolio. Bill didn’t bite. And that’s fine. As professionals, we can disagree from time to time. And it’s healthy to consider differing viewpoints. That’s how you learn, after all. Amazon registered the new website address: “www.amazonethereum.com”. And it registered another: “www.amazoncryptocurrency.com”. And this was on top of the already registered “www.amazonbitcoin.com”. But if history tells us anything, this is likely just the beginning of something exciting. As I said, I think Amazon is getting ready to launch its own digital currency. And I can’t think of a better company traded on a U.S. stock exchange that could pull this off. These coins are kind of like frequent flyer points. They have a clear value and can be redeemed for Amazon applications or other services; but they cannot be transferred, sold, or converted back into a fiat currency like the U.S. dollar. This was just the first step. For a company with annual revenues the size of a decent-sized country, it is in the position to issue a real currency, cryptocurrency, or digital token that is fully convertible into popular cryptocurrencies like bitcoin and ether. And if a cryptocurrency or token is convertible into bitcoin or ether, it’s convertible into U.S. dollars or just about any other form of fiat currency. And what’s the best way to guarantee such convertibility of an Amazon cryptocurrency? Simple: create a marketplace to do so. And that’s precisely why Amazon has locked up the domain names above. This is where the issuance of a digital token or cryptocurrency has significant advantages. Not only is it completely fungible, it is also divisible down to the smallest amounts desirable. So… how would it work? Amazon would either issue a finite number of Amazon-coins or employ a slightly inflationary monetary policy, something aligned with Amazon’s rate of growth over time. This might be something similar to Ethereum’s monetary policy. It would likely do what is called an airdrop of Amazon-coins into Amazon Prime customers’ accounts. An airdrop simply means that it would distribute the crypto assets to its ecosystem of customers and partners to get the system started. And Amazon is the perfect company to do this. It has the ideal ecosystem of partners, retail customers, and business customers to leverage. For starters, Amazon already has 300 million individual customer accounts worldwide. That’s roughly the population of the United States. Amazon also has 100,000 sellers on its platforms with hundreds of millions of items for sale. Also, nearly half of all shoppers use Amazon – not Google – as a search engine to find products when they go online. This is the big difference between Amazon and these tiny four- or five-person teams that are writing white papers and having initial coin offerings (ICOs) to raise money. There is a massive, vibrant economy taking place around the world that’s already linked to Amazon. And this Amazon ecosystem would be able to utilize Amazon-Coin as soon as it’s issued. The emergence of blockchain technology is an area of intense focus for me. Everything I’ve uncovered tells me that we are just at the beginning of a revolution in blockchain-related technologies and cryptocurrencies. But nobody has really considered the impact of a multinational corporation like Amazon issuing its own digital currency. For the reasons I laid out, I believe Amazon-Coin isn’t just possible, I believe it’s imminent. When this happens, it will signal the institutional adoption of blockchain technology. And when Amazon issues its own cryptocurrency, what’s to stop other major companies from following suit? Perhaps one day, you’ll book your next flight using American Airlines-Coin, or pay for your trip to Disney World with Disney-Coin. It may seem too far-fetched. But these companies have issued customer “reward points” for years. A company-backed cryptocurrency is not beyond the realms of possibility. What that means is that blockchain and digital assets will no longer be a curiosity of the mainstream investing world, they’ll be adopted with open arms. As a result, high-quality blockchain projects like bitcoin and Ethereum will likely appreciate several times over in the years ahead. So get ready. The blockchain revolution isn’t just imminent. It’s here. P.S. I recommended Amazon to Near Future Report readers back in December of last year. It’s up about 42% since then. I don’t advise buying Amazon now, since it’s above my recommended buy-up-to price. But here’s the thing: You don’t have to buy Amazon stock to profit from the blockchain revolution. I’ve identified three ways to profit securely as this trend plays out. Here’s the best part: You’ll never have to log on to a crypto exchange or download a digital wallet.